Defending West Regional champion Kashon Harrison came into Saturday's race determine to qualify for a return and ran cautiously making every effort to stay out of trouble. He moved to the lead early and controlled the pace through the two loops of the corral area with two runners with him and a pack of five or six runners just a bit back in tow. 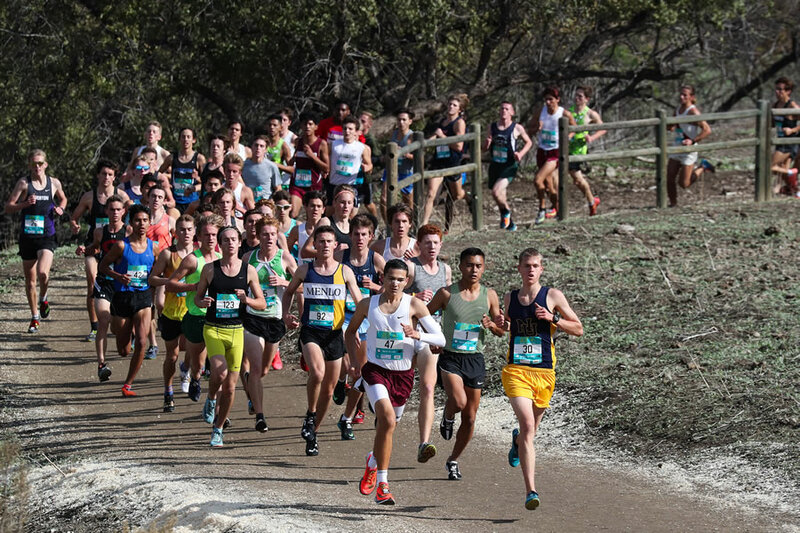 By the time he had reached the second of the reservoir hills the New Mexico State Champion had opened a sizable lead. He was well up the last grade before the chase pack began the last ascent. With the race in hand Harrison apparently held back so as to save energy for nationals. Harrison broke the tape with a time of 15:33. The time is good but hard to compare as the area had heavy rains and Doug Todd's crew had to work to lay wood chips in areas. 15:43. 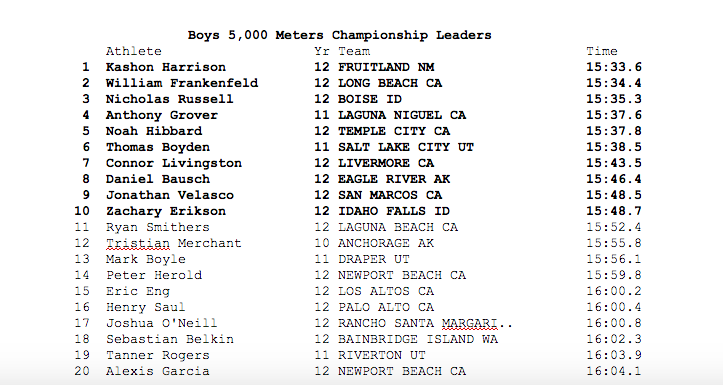 Alaska Division 1 Champion Daniel Bausch claimed 8t in 15 46 and Jonathan Velasco of California annexed ninth with 15:58. 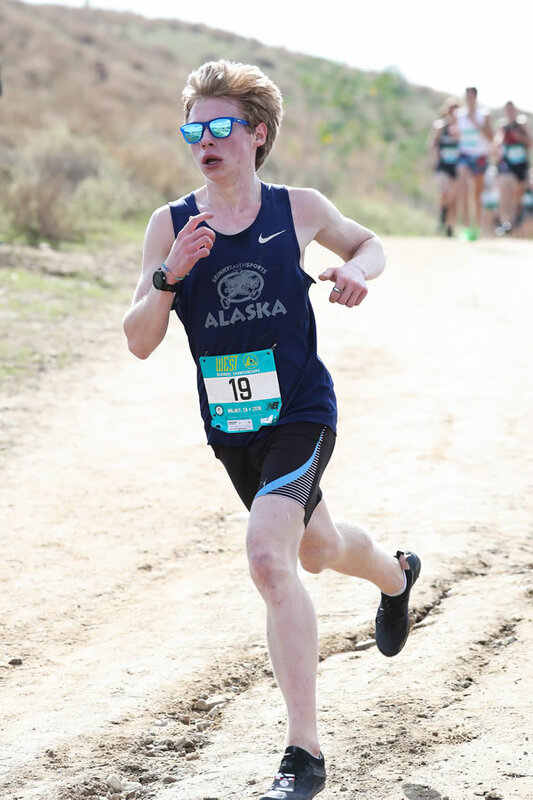 Zachary Erikson, who had placed second in Idaho behind Russell, was the final qualifier with his mark of 15:48, while Ryan Smithers of California ran 15:52 to be listed as the first alternate. Narrowly missing was Anchorage's Tristian Merchant, who extended his season a month to try to qualify. Of note also is that this was the first time two runners from Idaho in the same year and of course with Alexa they had three. 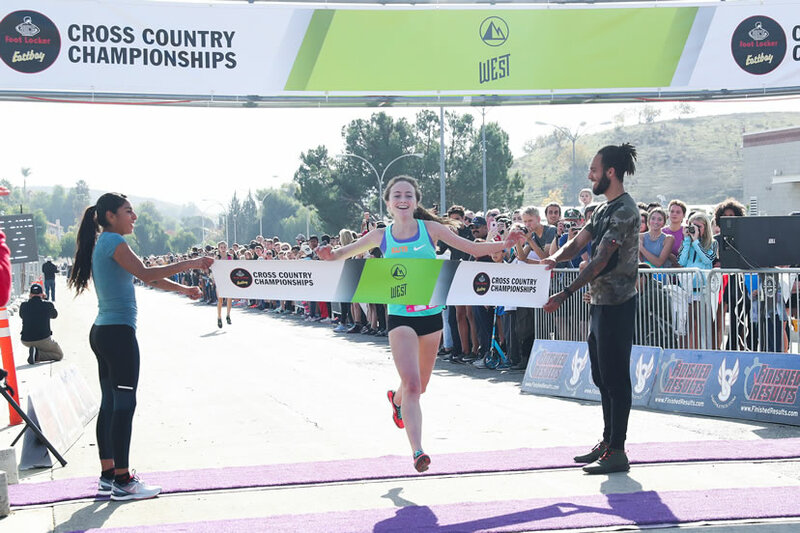 An injury last fall kept Kristin Fahy from qualifying for the race but this year she took the lead early and controlled the pace through the corral area. The California San Diego Champion exalted, when she crossed the finish line that she had finally made nationals but in so doing she joined her brother Darren as a West Champion (Darren won in 2011). The victory was certainly vindication for Fahy but it was also vindication for Allie Janke of Spokane as well as Anna Martin of Utah, who both ran fine races last year but narrowly missed qualifying when they finished 15th & 14th respectively. 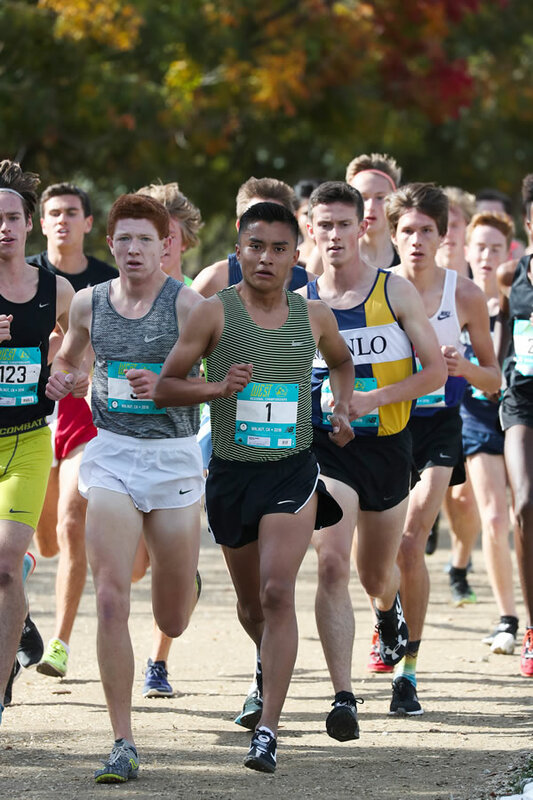 This year Allie ran conservatively and the Washington 3A champion earned second with a time of 17:57 and was followed by Martin, the Utah 4A champion, who was third. Idaho's Lexy Halladay, who had one of those days earlier this year, ran 18:11 to take forth and become only the fourth girl to qualify for Foot Locker. (Mary Lyons, Nicole Nielson, Emily Nist & Mikayla Malaspina were the others, although Kinsey Gomez, who fell & broke her wrist in 2009 yet still placed 11th, deserves specail mentin here too). 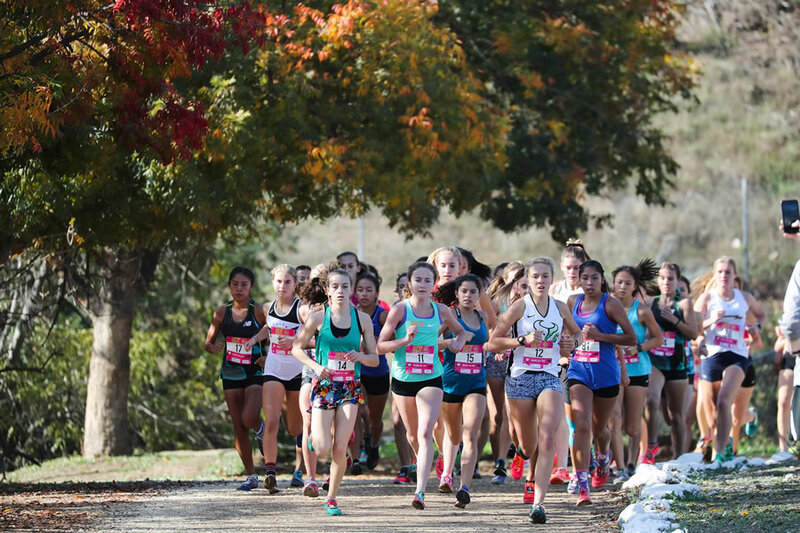 Californians annexed the next three places with Gabrielle Peterson taking 5th (18:12), Audrey Suarez 6th (18:18) & Hana Catsimanes 7th (18:20). Olivia Markezich ran 18:21 finishing 8th one place ahead of Spokane's Erinn Hill, who ran 18:24. 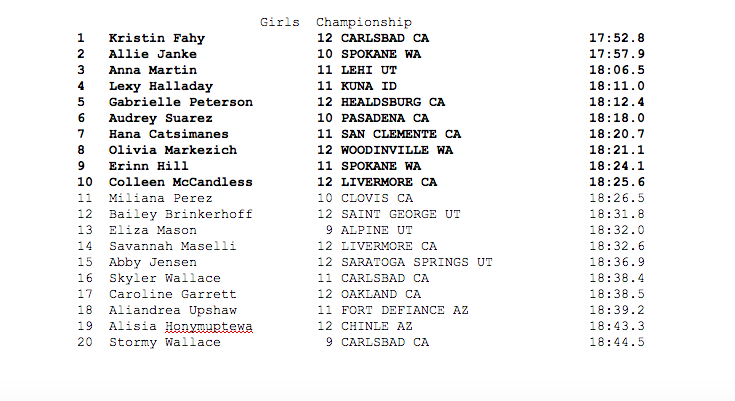 Colleen McCandless of California came in tenth in 18:25 & one the one second separating her & Miliana Perez of California was the difference in being an alternate. Bailey Brinkerhoff of Utah rounded out the top twelve with her time of 18:31.